Did You Know You Could Stamp with Amplify! We have a beautiful technique to share with you today which comes courtesy of Kazuko Kocho who demonstrated the technique at our Creativation booth this year. Amplify! in Radiant Neon is a super fun way to add texture to your paper craft projects. (Did you know you can use it on decorative* fabric projects too?!) With Kazuko’s stamping technique, the possibilities are endless! *Fabric projects that do not need to be laundered. Miscellaneous: white cardstock, stamp positioner, foam adhesive, craft knife. 1. Cut a card base measuring 4.25 x 11 inches, fold in half. Ink opposite corners with Memento Luxe Lilac Posies. Cut white card stock 4 x 5.25 inches, stamp Paisleys with Versafine Deep Lagoon ink, cut out centers with craft knife. Spritz with Dandelion and Lilac Posies Fireworks. Run edges of this panel along the Versafine Deep Lagoon ink pad. 2. 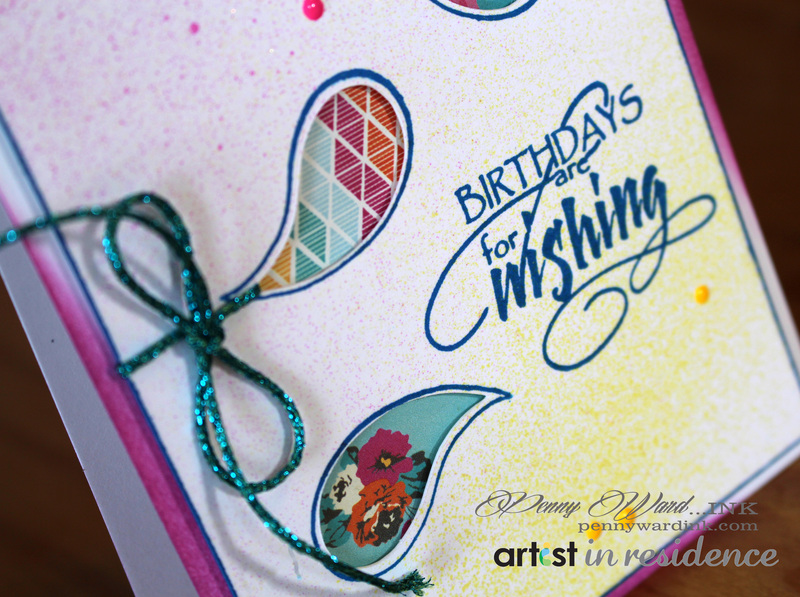 Stamp greeting with Versafine Deep Lagoon ink, tie cord around Paisley opening and edge of card. Apply foam adhesive strategically to back of card front, adhere small scraps of pattern paper at Paisley openings. 3. Mount to base card, apply Neon Yellow and Neon Pink irRESISTible Pico dots as desired. The folks at Rubber Moon were super kind to send me a Mixed Media Clock to play with. As you may know, I am not a Mixed Media kind of gal, but I must say…I love how this turned out. 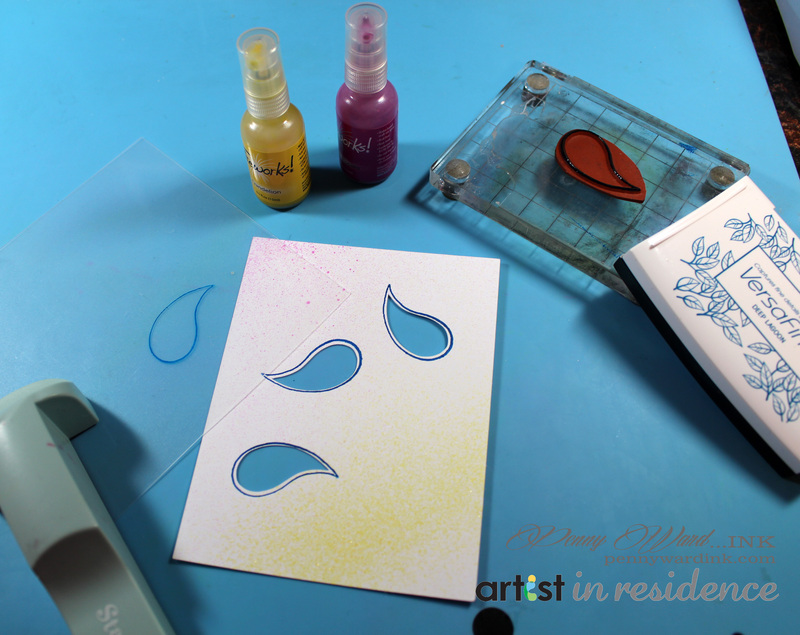 Stamping (all stamps by Rubber Moon), coloring, heat embossing…it has it all. Not only was decorating this clock too much fun, but it is practical also….I am thinking personalized clocks for gift giving! When I was told about this RubberMoon project, I looked on their website if any of RubberMoon stamps that I have had for many years were still available. Amazingly, they are and just as popular as before! Even the stamp saying “please send me your catalog” which I used a lot before internet era. (For young readers, in those days we had to send a snail mail request to stamp manufactures to ask for their printed catalogs). Back then, coming home to find a stamp catalog in the mailbox was soooooo exciting! 1. Trace the clock face circle onto white cardstock. 2. With a Jumbo Dauber, sponge Memento Luxe Peanut Brittle randomly inside of the circle, then add/blend Memento Luxe Toffee Crunch followed by Memento Luxe Danube Blue. 3. Begin stamping around the edge of circle using the “Zen Garden” stamp inked with Memento Luxe Rich Cocoa. Repeat with Memento Luxe Peanut Brittle. 4. Once the stamp ink has dried, cut out the circle. 5. Adhere the stamped circle onto the coordinating chipboard circle piece from the clock kit. Spray with GooseBumps and let air dry while working on the next steps. 6. Color the clock numbers piece with Memento Luxe Danube Blue with a Jumbo Dauber; allow to dry completely. 7. Sprinkle Walnut Crystals onto the piece, then mist with Sheer Shimmer Spritz Frost. There is enough liquid in the Shimmer Spritz to allow the crystals to turn liquid and antique the chipboard piece. Allow to air dry. 8. Adhere the numbers onto the circle clock face. 9. Punch a circle in the middle for the clock mechanics; set aside. 10. Hand tear strips/pieces of handmade and/or printed papers for creating the clock base. 11. Use Memento Luxe Peanut Brittle and StazOn Timber Brown to antique the paper as needed. 12. Collage paper strips onto the clock base with Creative Medium, using it as both and adhesive and a sealant. 13. Cover any uninked areas with Memento Luxe Danube Blue and add Creative Medium if necessary. 14. Stamp the houses onto watercolor paper with StazOn Jet Black. 15. Mix desired colors of Memento Markers with Shimmer Spritz Frost to create a shimmery watercolor palette for coloring the houses. 16. Repeat for the “Frog Girl” stamp. 17. Assemble the mechanics of the clock. 18. Add stamped images to the base of the clock. 19. Stamp sentiment and add to the clock base. 1. Cut red cardstock to a 5″ x 7″ card and a piece of white cardstock just a bit smaller. 2. Stamp Forest Pine with Memento Luxe Northern Pine, then heat emboss with clear embossing powder. 3. Stamp additional trees with Memento Luxe Pistachio and Olive Green overlapping the design. 4. Die cut ‘Merry’ in the trees and make sure to keep the small pieces from the ‘e’ and ‘y’ to fill in the letters. 5. Spritz top edges of trees with Fireworks! Summer Sky and spritz the whole card with Sheer Shimmer Spritz Frost. 6. Adhere trees to red cardstock and remember to add in the extra pieces to the ‘e’ and ‘y’. 7. Stamp ‘Merry and Bright’ with Memento Luxe Northern Pine and add a few stars to the trees with Delicata Silvery Shimmer. 1. Die cut gears from black cardstock. 2. 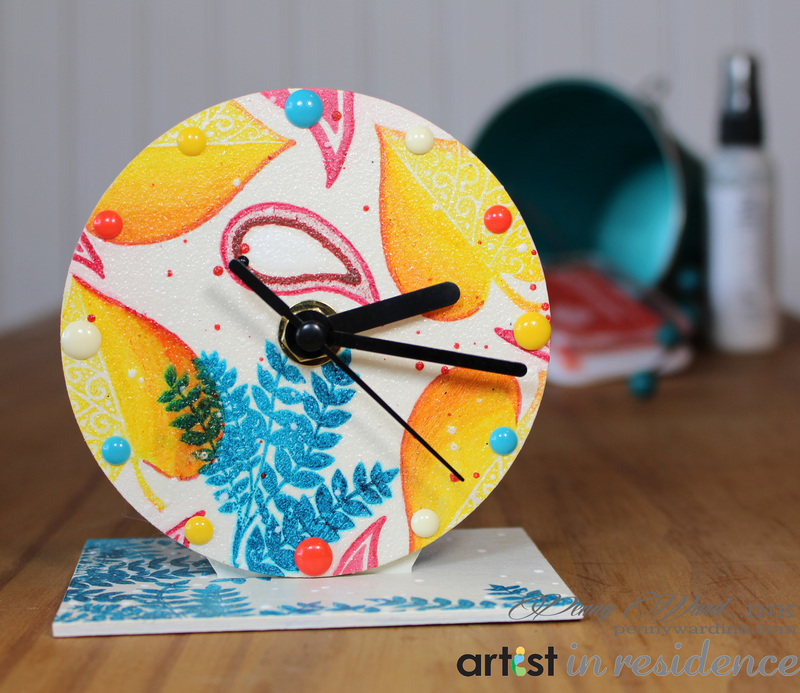 Randomly apply Memento Luxe Morocco with a Jumbo Dauber onto the gears and allow to dry. 3. Remove spray head from the bottle of irRESISTible Bronze Texture Spray and apply with a paintbrush to cover the gears. The combination of the Morocco ink and the Bronze finish will give the gears a rustic look. 4. Secure the spider web stencil into place on white cardstock. 5. With a bristle brush, apply Memento Luxe Pistachio, Teal Zeal, Nautical Blue and Gray Flannel to color the background. 6. Remove stencil and trim to size. 7. Edge this piece with Morocco. 8. Stamp sentiment onto a small piece of white cardstock with Brilliance Graphite Black. 9. 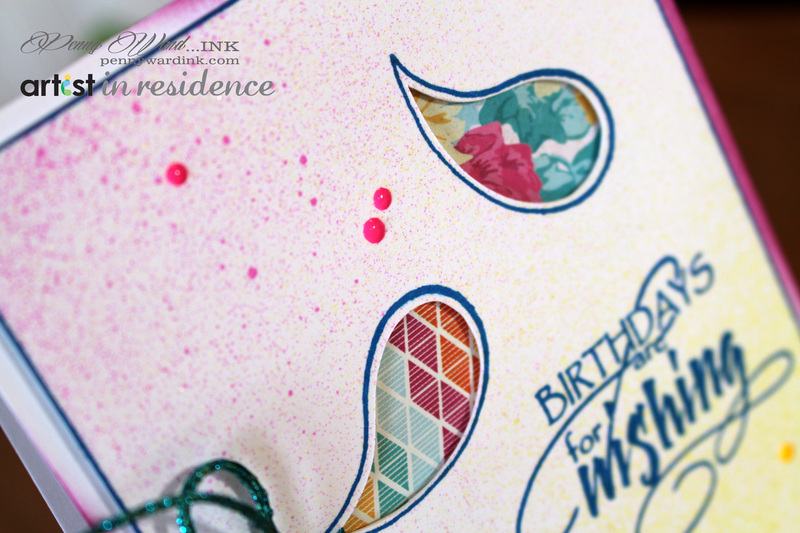 Lay the spider web stencil onto the sentiment piece and color as the same process as before. 10. Die cut spiders and bats from black cardstock and add to the card. Kazuko’s helpful hint for working with die cuts…. To remove the little pieces of paper from your dies, use a lint roller (with the sticky paper) to roll across the dies to catch the paper pieces and remove them from the die. It also helps to have the die setting on the IMAGINE Crafts Craft Mat – the static electricity will help hold things in place while rolling. We’ll be giving three prize packages which will include IMAGINE Crafts irRESISTible Texture Spray, irRESISTible Pico Embellisher, Delicata Shimmery Silver and Golden Glitz AND some of the newest releases from Magenta. Each day will we feature projects created by both company’s design teams – simply visit their blogs and leave a comment on each post by midnight PST September 21st. We ‘ll randomly select three different blogs from the seven days, then randomly draw one commenter from each blog as the winner. 1. Sponge StazOn Jet Black onto the frame with an InkBlusher. It’s alright for the ink to be applied unevenly. 2. Paint All Purpose Ink Black Pearl onto the frame to add sparkle and to antique the frame. Allow to dry completely. 3. Select images to use from the Paris and London Dog Tag sized Photo Elements and cut to size. 4. Apply Creative Medium to the backside of each image and adhere to the frame. 5. Once all of the Photo Elements have been adhered to the frame, apply at least two coats of Creative Medium (as a sealant) onto the entire frame and allow to dry completely. 6. Cut chipboard and foam core to the size allowing them to fit inside of the back of the frame. 7. Adhere these two pieces together. 8. Wrap the chipboard/foam core with fabric of choice and adhere to the backside. 9. Mount the fabric covered backing into the frame. 10. Add knobs and any other decorative elements like ribbon to complete your new frame.